Casa Correas is located in a privileged place if you are looking for tranquility, nature and at the same time being close to all this is your place. 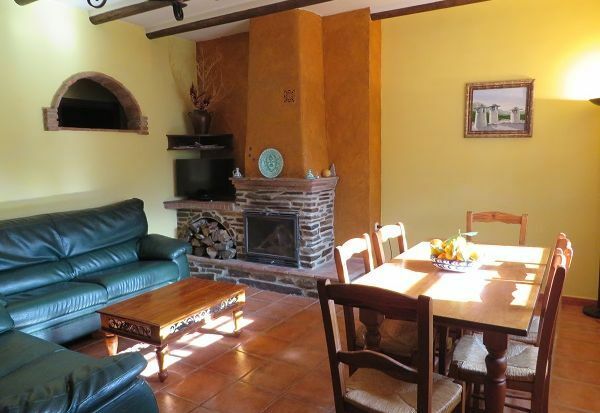 You have the tranquility of the countryside in a farm surrounded by olive trees and orange trees, you are 10 minutes from the town and very well located to visit the Alpujarra, the Costa Tropical and the city of Granada. The house has a private garden and swimming pool and is adapted for the disabled. It has a room and a bathroom that includes a wheelchair and entrance ramp to the house. The wood for the fireplace is free during the entire stay. Pool open in summer, in spring depends on weather conditions and at the discretion of the owner. Me and my family had a wonderful holiday here. Angeles was so welcoming and helpful, she answered all my questions before and after I booked very quickly and courteously. The cortijo was clean, spacious and very private. The pool was perfect, beautifully kept and though close to the house it was secluded and private. ( bolsters) difficult to be comfortable with and the mattress covers were not breathable so were hot to sleep on. The kitchen was adequate but has no oven and some pieces of equipment are a bit small for five people eg the coffee maker and the kettle. An electric kettle would be better. But these criticisms are small and overall the cortijo is a wonderful place for a family holiday. We would definitely stay here again. Thank you Angeles for being such a kind and thoughtful host! Nos ha encantado los días que hemos pasado en el alojamiento. Todo estupendo. A la casa no le faltaba ningún detalle, la propietaria encantadora, el entorno estupendo. "après un premier séjour d''une semaine en 2011 nous avions prévu de retourner a cette location. chose faite pendant 3 semaines cette année. comme on dit jamais deux sans trois nous retournerons la bas"
"Nous avons passé un séjour trés agreable dans un site calme et magnifique,un logement bien agencé,au milieu d''un champs d''oliviers; des proprietaires toujours disponible et trés sympa,nous reviendrons encore." et la tranquillité de ce gîte qui en outre offrait tout le confort permettant de passer un séjour très agréable dans un environnement idyllique. Propriétaires toujours à notre écoute et d''une gentillesse sans égale. Nous espérons revenir."